What a weekend! I'm currently back home in the OC and I'm superglued to my bed and it's never felt more comforting. I took a much needed nap and when I woke up, I knew exactly how my iPhone feels after it charges up from death and finally powers on after a couple percent. As exhausting as it was, a close-to-home Coachella trip to experience amazing live music, grand parties, and the whimsical beauty of Palm Springs is always worth it. James Jeans vest and shorts. Motel top. BC shoes. Check out my #JamesJeansxCoachella adventure on Instagram! I brought one of my favorite clothing brands James Jeans out with me to start the weekend in some cute and comfortable denim wear. I am in love with their new Spring collection as every piece is perfect for festival season and they just had to make an appearance at the biggest festival of them all. 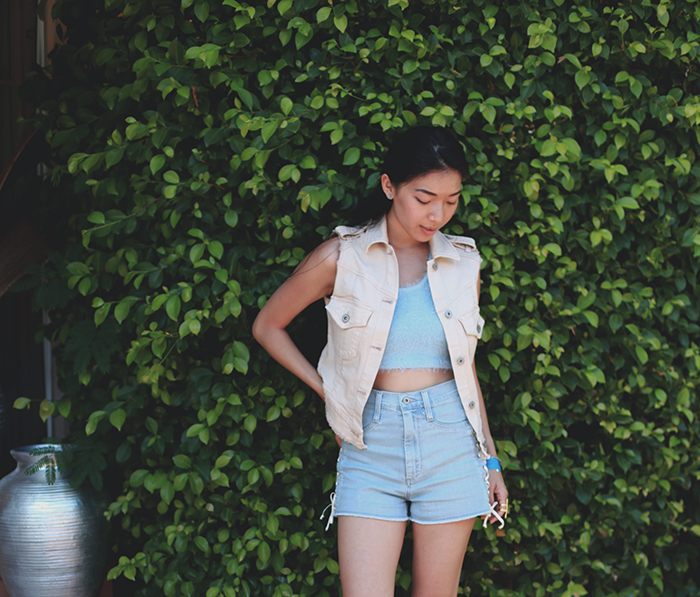 High-waisted shorts are pretty much my go-to style for Coachella, but I look for details to be sure that they're not just like every other denim shorts roaming around the desert. And that's the very reason why I am obsessed with these playful lace-up sides of their Cover Girl shorts. We drove into the desert Friday morning and landed straight at the colorful Saguaro hotel for the Opening Ceremony party as our first stop on the agenda. Kyle and I started our first party scene with [literally] really cool drinks at the Reyka Ice House, complete with delicious fruity cocktails and fun ice mugs. We met up with my blogger partners in crime, Chanelle and Enocha, and checked into our adorable Spanish-style hotel, which provided the perfect backdrop to lounge about with provided mimosas and snacks before really popping off the night. We drove out to my favorite slice of oasis, the Merv Griffin Estate, where Soho House was perching for the weekend and the Forward by Elyse Walker party was happening. Glamorous day beds, a splendid lake, and copious amounts of delicious food easily dubbed this as my kind of event. After getting our fix of charming Palm Springs chic life, we were ready to get down and desert-dirty for Outkast, the sole reason why we came to Coachella. I changed into James Jeans' striped jeans since the desert chill creeps in as soon as night hits; the winds pick up and sand is everywhere. Luckily my vest kept me warm enough to dance the night away after the Outkast set at the Details Magazine after-party. Perhaps the warm grilled cheese they catered helped as well. Although we usually like to remember Saturday as the big night out, I think Friday unexpectedly turned into my favorite night and I'm for sure happy I got to look cute in James Jeans for it. Check out the winner of the James Jeans giveaway here. Gorgeous photos! Love this look!